All of our vehicules are thoroughly inspected so you can have a WORRY FREE PURCHASE. All Financing options available, even 2nd chance and 3rd chance credit. We welcome trades-in and evaluation is done within 20 minutes plus on-spot delivery available. ALL OUR PRICES ARE FULLY TRANSPARENT AND ALREADY NEGOCIATED AT THE BEST MARKET PRICE. THE PRICE YOU SEE IS THE PRICE YOU PAY WITHOUT SUPRISES! 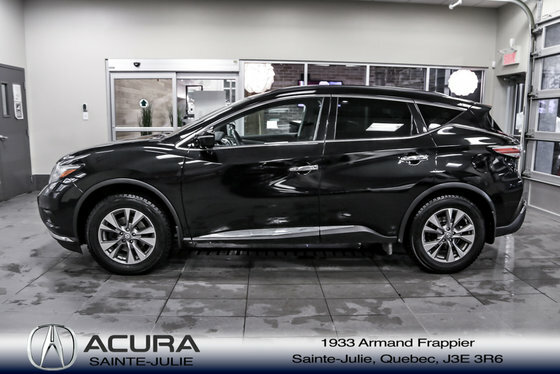 COME TAKE ADVANTAGE OF THE USED CAR INVENTORY OF THE BIGGEST ACURA DEALER ON THE SOUTH SHORE.WE HAVE A DIVERSIFIED INVENTORY WITH AN AVAILABLE CARPROOF REPORT, BUT MOST IMPORTANTLY WE HAVE THE MOST COMPETITIVE PRICES ON THE MARKET!!! Want to try the 2015 Nissan Murano SV AWD?